Today is the 24th April. It is also World Meningitis Day. To mark the day I’m sharing some key information about what can be a serious and indeed fatal infection. 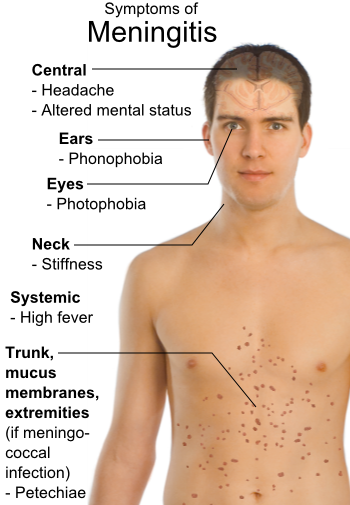 Meningitis is an infection of the meninges which are the protective membranes around the brain and spinal cord. Any infection of the meninges is most likely caused by a bacterial or viral infection although parasitic or fungal infection are known. The bacterial form of the disease is most serious and more commonly affects children under 5. According to research carried out by ACT for Meningitis as a result of this many believe that the disease only affects children however this is most definitely not the case and all should be aware of what to look out for. 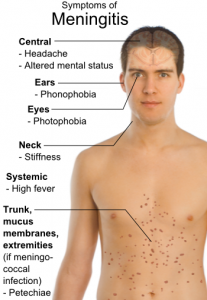 Viral meningitis is the less serious form of the disease. Many contract it and many never know as it can be similar to any flu-like illness and so recovery will occur after a week or two and with use of pain relief. For those who contract the bacterial form of the disease it is much more serious. It should be treated as a medical emergency. Treatment is by antibiotics and if caught quickly many will recover fully after a hospital stay. There are, unfortunately, many cases that result in complications. Issues such as loss of limbs or hearing loss can be permanent reminders of infection with the disease. Next articleThat moment of sheer panic when…..
Great post. I have nursed children who survived because of early intervention. Sadly a friend of mine in his thirties became ill. He thought he had flu. The following day he was worse and after his wife dropped their older kids to school she came home to a v ill man. He was admitted but died hours later. Maybe if he’d gone in the night before he would still be here. Information is key as well as immunisation. tric recently posted…Anyone can learn to drive? Thanks Tric. What a sad story of your friend. It can certainly be a brutal disease. Immunisation is absolutely key and important to ensure. Thanks for mentioning that! Although sadly it doesn’t cover all strains at least it offers some great protection. Hopefully many a life has been saved by it.